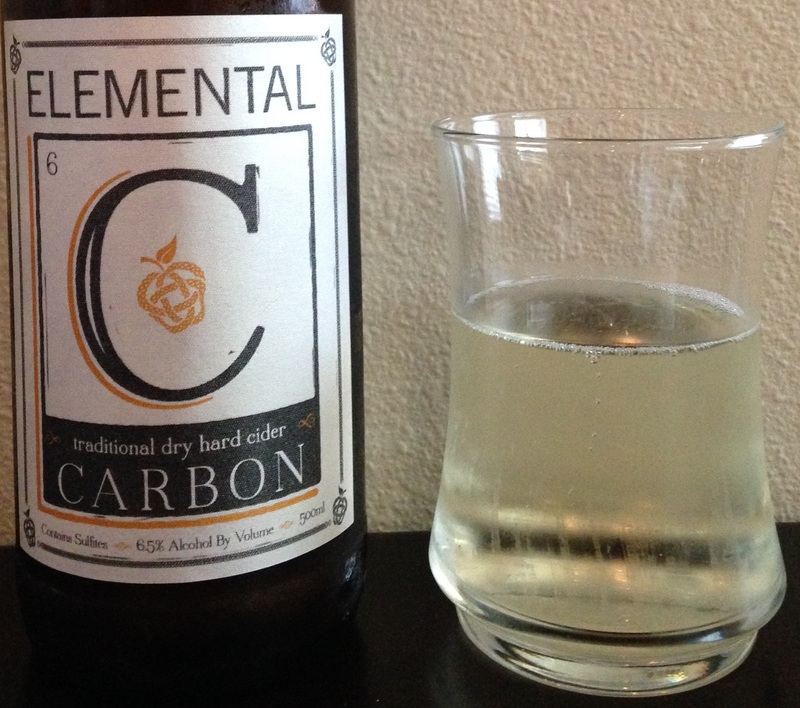 Review of ‘Carbon’ from Elemental Hard Cider, their traditional dry cider. 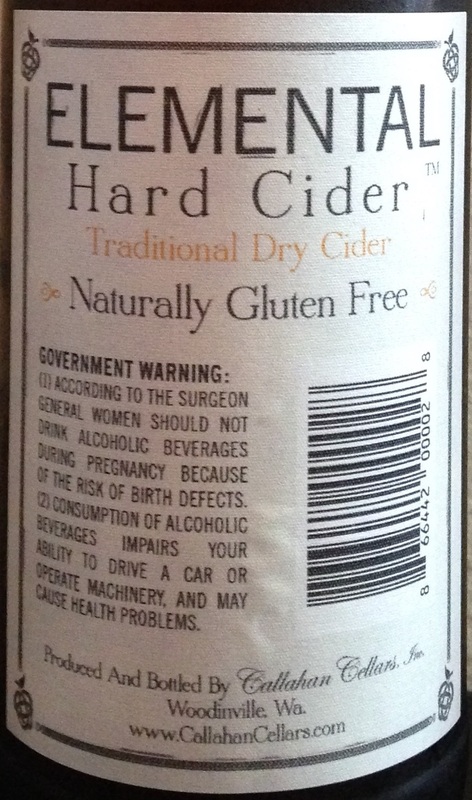 Cider Description: Our Traditional Dry Hard Cider is a European inspired cider. The experience is crisp, clean and tart. This is the perfect cider to pair with any meal. Cidery Description: Each of our hand-crafted ciders are made from only the finest Northwest apples and cold-fermented to preserve the fruit. Our ciders are reminiscent of champagne, they are lightly filtered and mildly effervescent for clean taste. Experience our quality for yourself. Come in often to grab a glass. We are constantly trying out new flavors, so the line-up is always changing. Brian and Christina Callahan launched Elemental Hard Cider to bring quality, affordable, and delicious hard cider to the world. We strive to bring fun and exciting flavors to the experienced cider enthusiast, as well as novice cider drinkers. Their current lineup includes Carbon (traditional dry), Helium (pear), Oxygen (pomegraniate), Nitrogen (acai), Hydrogen (grapefruit), CO (cherry), Pineapple, Spiced Apple, NW Atomic Root Beer, and Jalapeno Lime Cilantro, although some of those are seasonal and/or special releases. 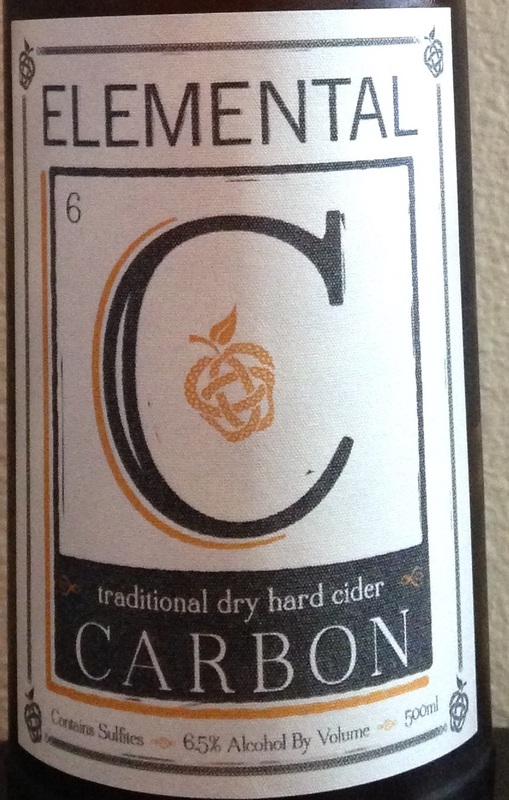 How Found: There has been a lot of talk on Facebook and such about this relatively new cidery (May 2014), so I’ve been wanting to give them a try. I actually tried a taste of their Cherry on tap at the Schilling Cider House awhile back, but I didn’t count that so much. Their other varieties I could find in bottles didn’t sound appealing (acai and pomegranate), so I decided to go for their flagship traditional dry cider. First Impression: Very light color. High carbonation with little bubbles. Dry clean apple scent. Opinion: Dry. Simple yet complex. Refreshing and clean taste. Moderate acidity, tartness, bitterness, and tannins. Quick finish. Slight earthiness. Champagne-like mouthfeel. Most Similar to: Argus Fermentables Ciderkin. Like very very similar oddly enough. Closing Notes: A solid cider, but not really a style I enjoy. I think its a great sparkling wine alternative. I’d be interested to try more of their ciders. However, I go for more of a bold flavor, often barrel aged, and I don’t really see them heading in that direction. I didn’t get a chance to try their NW Atomic Root Beer at Cider Summit, but that seems to be quite popular. Have you tried Elemental Carbon? What did you think?